As the years go by, more and more Baby Boomers join the ranks of senior citizens. The geriatric spectrum ranges from active 90-year-olds to declining 70-year-olds. There is, however, one thing all seniors can do to improve their health and possibly extend their longevity, too. They all need to take care of their teeth and gums. There is actually quite a bit a dentist can do to help the elderly avoid tooth loss and other dental problems. Read on to learn what you can do for your smile throughout the aging process. The importance of daily oral hygiene throughout life really cannot be overstated. Brushing and flossing are essential to maintaining oral health. However, as a person ages, these tasks may become more difficult because of arthritis or other manual dexterity issues. One idea dentists often suggest is using an electric or battery-powered toothbrush. Floss holders are available as well. Both of these make twice-a-day oral hygiene easier for someone to accomplish on his or her own. As the body ages, many people are forced to take several different medications to support general health. But some of these can cause dry mouth. In fact, dry mouth is a confirmed side effect of more than 500 medications. Dry mouth happens when saliva production decreases. The condition can be uncomfortable and may lead to other problems including an increased risk of tooth decay and gum disease. In addition, having a dry mouth can make swallowing more difficult and bad breath more noticeable. The health of a smile is largely dependent on the gum tissue and bone structure that support them. 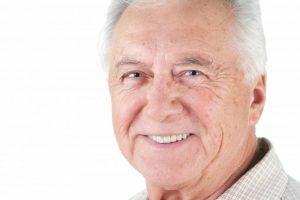 Therefore, special care during senior years is essential to avoiding gum disease, which is the leading cause of tooth loss among adults in the United States. Proper brushing and flossing at home combined with regular dental checkups is key. When you brush, always use fluoride toothpaste. Fluoride helps strengthen tooth enamel. Also, hold the brush at a 45-degree angle toward your teeth and gums. This way, you are able to clean the surfaces of your teeth and along the gum line where disease-causing plaque tends to accumulate. Finally, be sure to floss your teeth at least once a day. Move the floss down below the gum line, taking care not to press too hard against delicate gum tissue. A smile can be beautiful at any age, so be sure to see your dentist every six months. With the proper care, you can enjoy a golden smile in your golden years. The Darby Creek Dental team offers comprehensive dental care from the comfort of a state-of-the-art practice. For more ways you can look after your smile as the years go by, you are invited to contact the office today at 937-303-1533.